Eastlake Victorian: A Mystery to Solve! I have a mystery for you all. Do you think you can solve it? I love to look at all types of old buildings and interiors, even if they are not Eastlake Victorian! I can always gather some type of inspiration from the way people decorated in other eras. 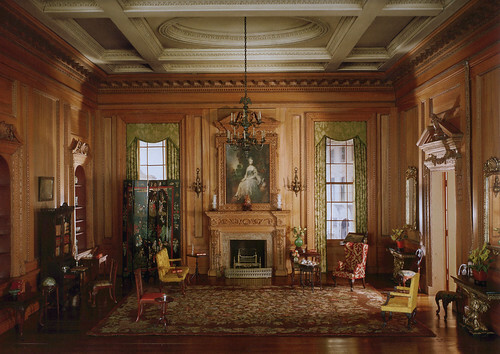 Here are some photos of some very grand rooms. They are all decorated in earlier styles than those that I prefer. If you want to view them larger, click on each to get to my Flickr page. Above each photo, click on "Actions" then "View all sizes" and select "Large" or "Original" to really see the details. 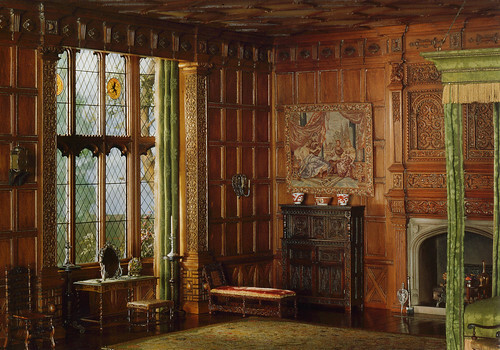 Here is a gorgeous room from a castle in England. I love all the beautiful wood paneling from floor to ceiling. And I really love the Elizabethan glass panes in the windows! 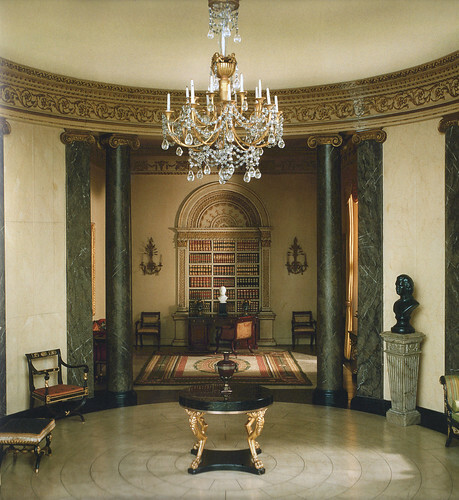 This is an 18th century English room. Again, much too opulent for me! But I do like all the attention to detail. Look at those walls and ceiling! It doesn't feel "comfy," but it sure is a sight to see! This is another example of English architecture. It's a rotunda. I like the fact that the room is round, but what really intrigues me is the library you see beyond. Wouldn't that be a grand way to display your books? It's hard to believe that people really lived in residences like this. 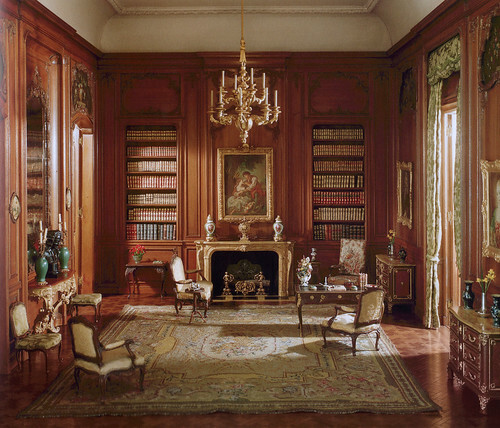 Speaking of libraries, check out this room! I think it's a bit more cozy than the last one. I love all these high ceilings! I also like the woodwork all the way up the walls and the nice, tall windows and doors. Wouldn't this be a great room for hosting a tea? Here is a true Victorian parlor. This one has wall-to-wall carpeting (which I don't like). The ceilings are a lot lower and the woodwork is painted white. I prefer dark woodwork, but it works in this room. Again, I think this would be a great room for entertaining! 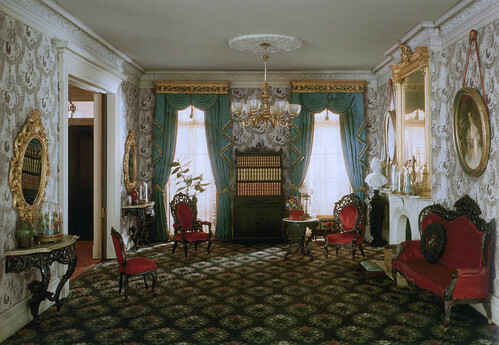 Finally, here's a Georgian room decorated with American Empire furnishings. I'm really drawn to the green color on the walls. I'd really love to play that piano in the back! All these rooms are beautiful, but much too rich for my taste. I still love to look at them! And here's the mystery: What one thing do all these rooms have in common? Feel free to leave your guesses in the comment area. I won't respond to any of them as I usually do, so everybody has the opportunity to guess. I'll reveal the secret in a few days! My guess is they are all in the same house!! 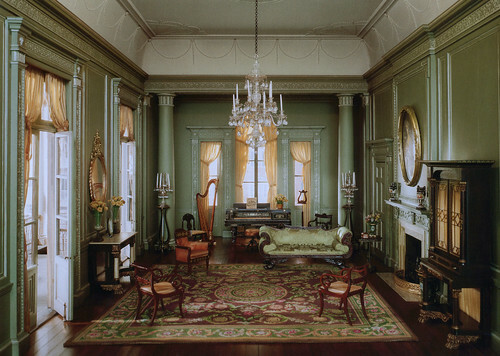 All these rooms have so much gorgeous details to look at, but at first glance, I see that they all have some type of green fabric - satin jacquard or damask, either as drapes or upholstery. I guess my eye is drawn to fabric first. Fun! It looks like the chairs are quite similar in each of the pics...like only a few in each picture, and they're all spread around the room...and you'd have to yell at each other to be heard if you sat that way! All open in the middle! They're all lovely, but much too fancy for my tastes! Give me a recliner and Television, and I'm just fine!!! Well, here is my guess: they are all done in miniature? Like the little dioramas in... is the Art Institute? That's simple...I love them all!!!! My first reaction is that they are miniature rooms...but what they all seem to have in common is they each seem to have a carpet in them. There's Too Much Fun Going On!